Yankee teams don’t win World Championships without good solid starting catchers. I’ve been a Bronx Bomber fan for over 50 years and during that time its been names like Berra, Howard, Munson, Girardi and Posada, who have been behind the plate when my favorite team won a ring. Most of these guys could hit, most of them were strong defensively as well and each and everyone of them were tough, strong leaders who weren’t afraid to take control of their pitching staffs. Russell Martin was that type of player for the Yankees. Certainly not a superstar but most definitely a leader behind the plate and a guy who craved at bats with the game on the line. He had no fear and the Yankees could have got to a World Series with him as their starting catcher, which is why it distressed me, when they let him walk away to Pittsburgh last offseason and decided they’d try instead to go cheap by staffing such a critical position with Cervelli, Stewart, and eventually Austin Romine. It was that single front office decision that convinced me that this current Yankee brain trust actually believed they could be clever money-ball practitioners when I knew they were not. More importantly, I knew that trying to win with less money took away the franchise’s biggest advantage over its competition, which is HAVING MORE MONEY to spend! We all saw the results. The offensive performance of the Yankee catching staff was as bad as I knew it would be last season and the co-catcher model hurt the stability of the pitching staff. There were also more empty seats in Yankee Stadium and fewer viewers watching those commercials on the YES Network. 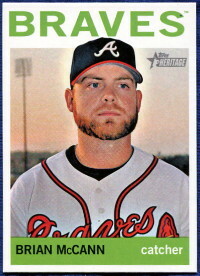 Brian McCann had to be signed by New York, this offseason. He’s exactly the kind of catcher the Yankees must have to get back to Fall Ball. He’s also the signal I needed to see that this Yankee brain trust fully realized the error of their penny-pinching ways last winter. I’m once again officially excited about Opening Day! McCann shares his birthday with Old Reliable, this former Yankee outfielder, this one-time Yankee catcher and this one-time Yankee pitcher.